I have yet another project to work on. This one is a big restoration project. 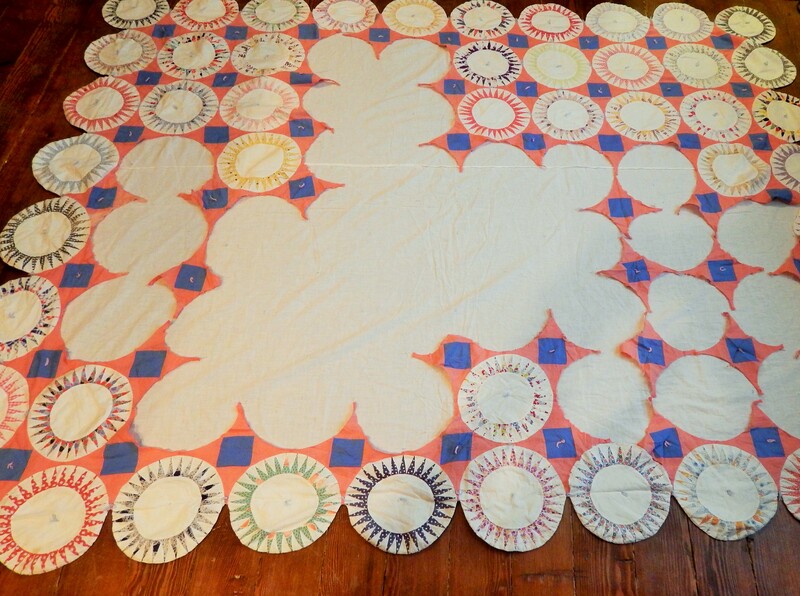 My Friend Julie Silber contacted me recently about a quilt that had been cannibalized for blocks. She thought I might be interested in putting it back into a useable form. 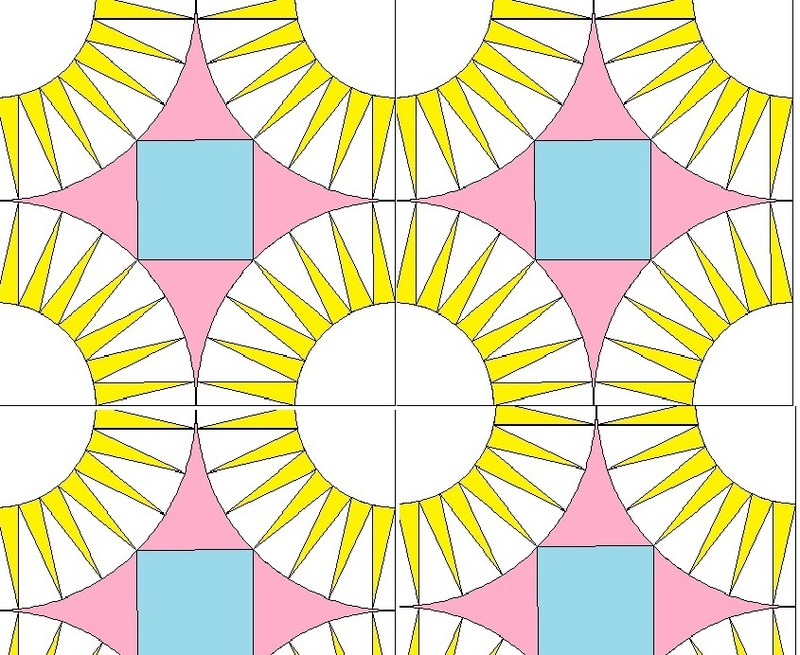 Julie Silber is one of the world’s most respected quilt experts. 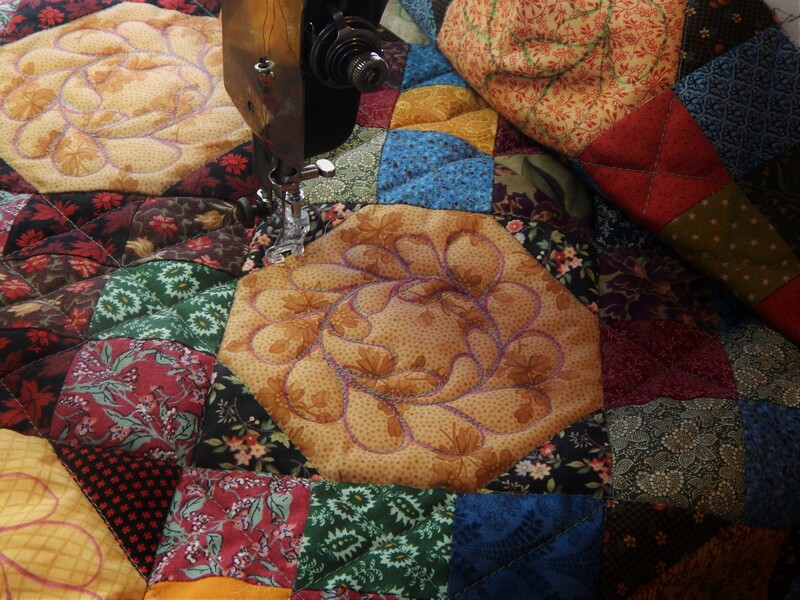 She has been selling antique quilts to museums, businesses, and individuals since 1968. 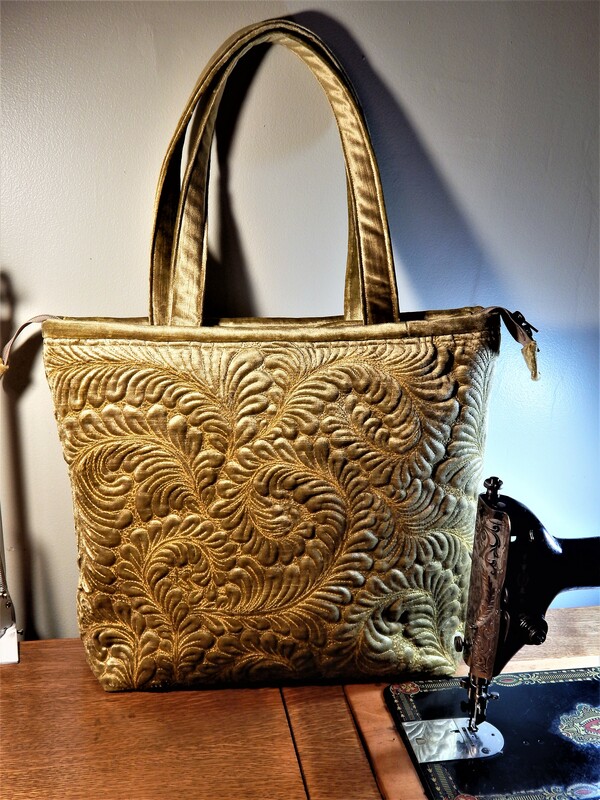 Julie was the curator of the world-renowned Esprit Quilt Collection in San Francisco and is the co-author of the critically acclaimed books, Hearts and Hands and Amish: The Art of the Quilt, and is an overall super person. 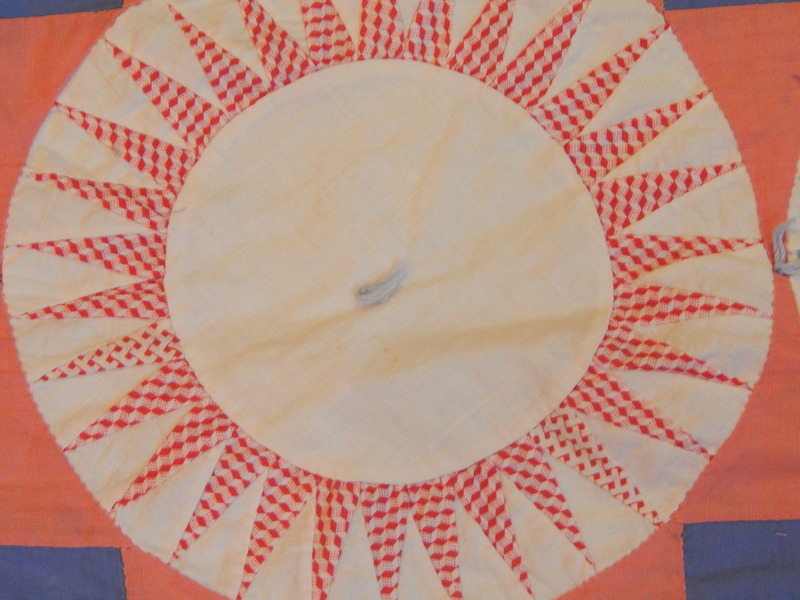 If you are a fan of antique and vintage quilts like I am you need to see her website http://www.thequiltcomplex.com/ be sure to look at the quilts for sale section, a great source of inspiration! Julie sent me the quilt to look at to see if I want to buy it…..YES I do…we need to finalize the deal but I couldn’t wait to post some pictures. The block has a few different names. I am using the name Indian Summer because it seems seasonally appropriate. and probably foundation paper pieced to get all those points to work out. 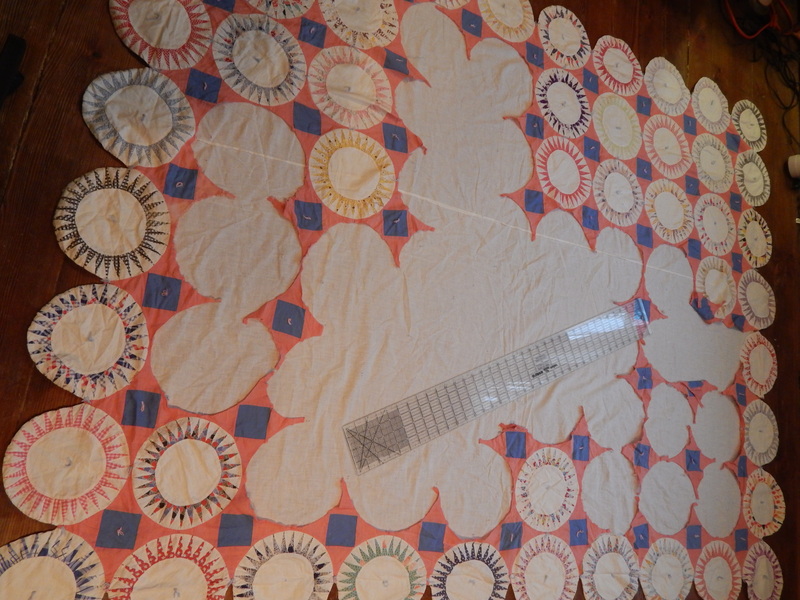 In this quilts the circles were pieced as one unit and attached to the pink and blue setting pieces. this was all hand pieced and not using paper piecing. As you can see from the picture this was a tied quilt. it has no batting so I imagine it was used in the summer. I said that it was cannibalized for blocks. someone started taking it apart, harvesting the circles presumably to use for some other project. the circles are small. about 7 1/2 inches finished size. and the triangles are about 3/4″ at the base and 1 1/2 inches tall. 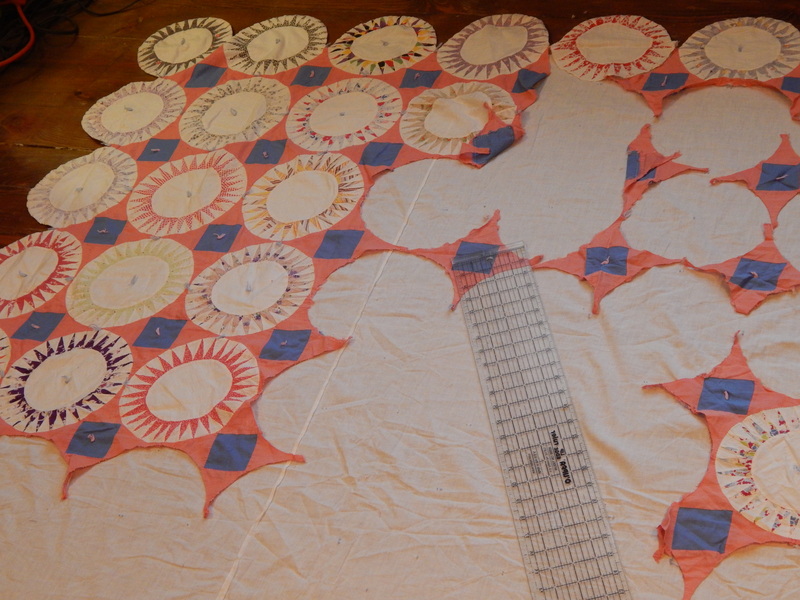 when I get it back together I plan to hand quilt it, even thought it was originally tied. It was used and washed in its past and some of the blocks are showing the results of that. The seam allowances are pretty far gone on some of the blocks and I will need to replace some of the fabrics in those blocks. I will post pictures of that when I get to work on it. ( I should have taken pictures of those rather than just the good ones) hand quilting it pretty densely will add strength to it and help keep the seams from further splitting. I think it will make a very pretty little quilt! 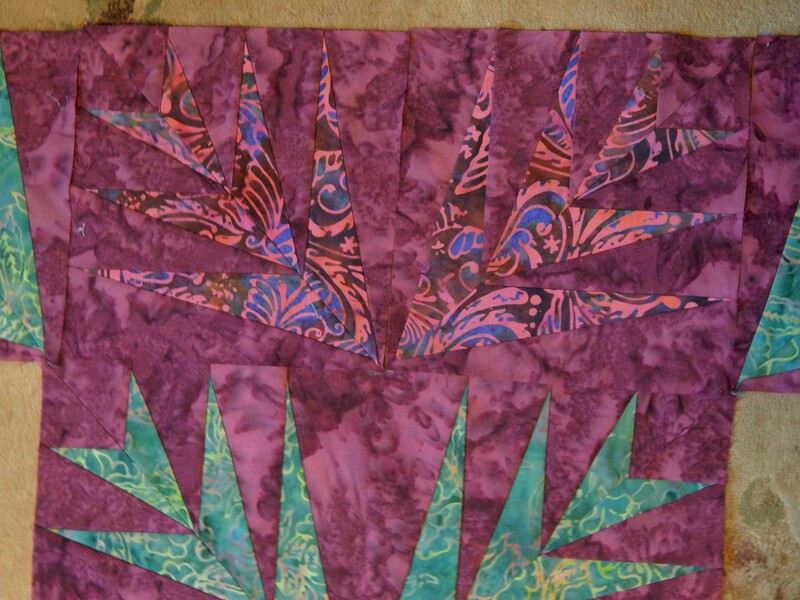 I did do a little more Paper foundation piecing on the Batik project. As you can see I have a hard time getting the camera to give me consistent color on this. I need to take some pictures in natural sunlight to get it right. But you can get the idea. Every block I do makes me more excited about how it is going to look. 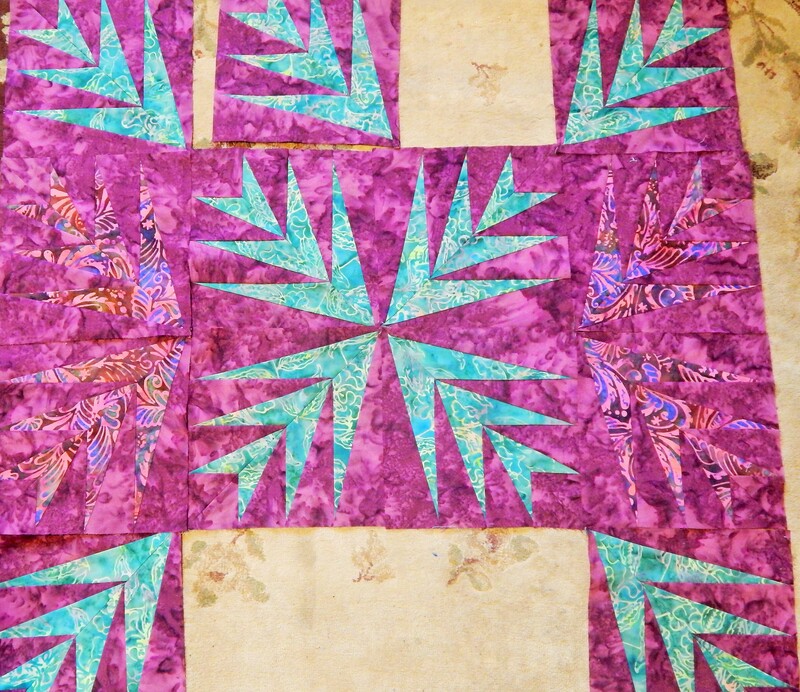 This entry was posted in Quilts and tagged indian summer block, paper piecing, quiltinmg, Quilts, vintage quilt top. Another treasure to be saved! 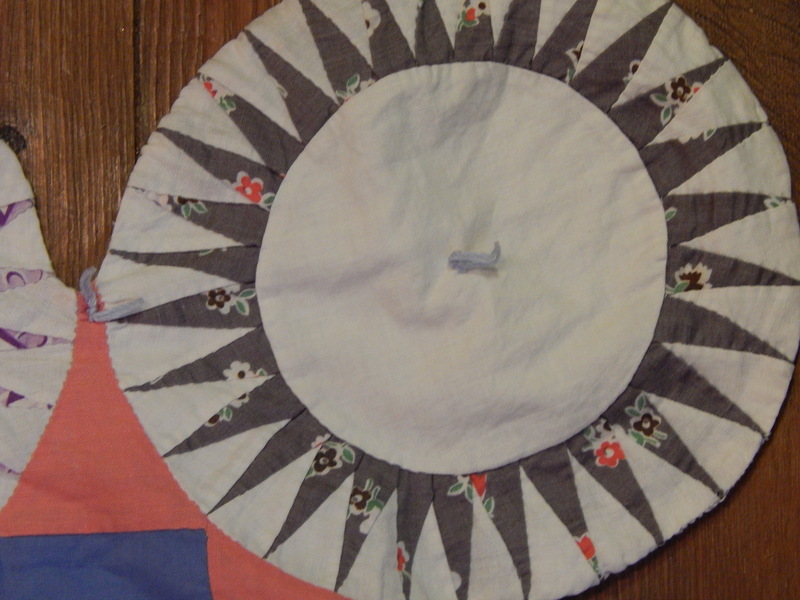 Isn’t it incredible that someone would make all these circles with all these points, by hand, and not add a binding or a batting or some quilting. I’m sure there is a story there. Hope you are successful in getting this and can’t wait to see how it turns out. I purchased a stack of old blocks at the Houston quilt show in the late ’90’s. They are 9-patch blocks, probably from the 1950’s or thereabouts. I had to resize about half of them. I am putting them together on the diagonal with plain white blocks in between. I with I were as fast a worker as you are! Most excellent blog. Thank you. Tim, you must be the most patient man in the world. I am sure it is going to be beautiful when you are finished. Oh, I hope you do get this one….once you work your magic on it, it will shine! I really like the batik quilt, too! Tim- I love the one sent to you! It will be gorgeous when you are done. I also like your batik. 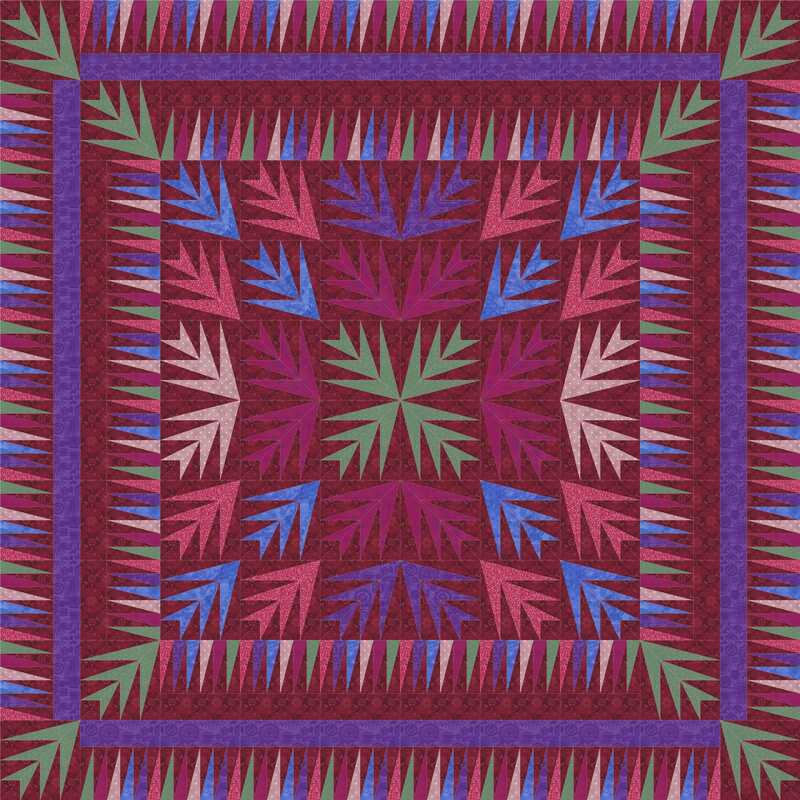 A quilt that would be really worth saving, I am sure that you will work your magic on it! 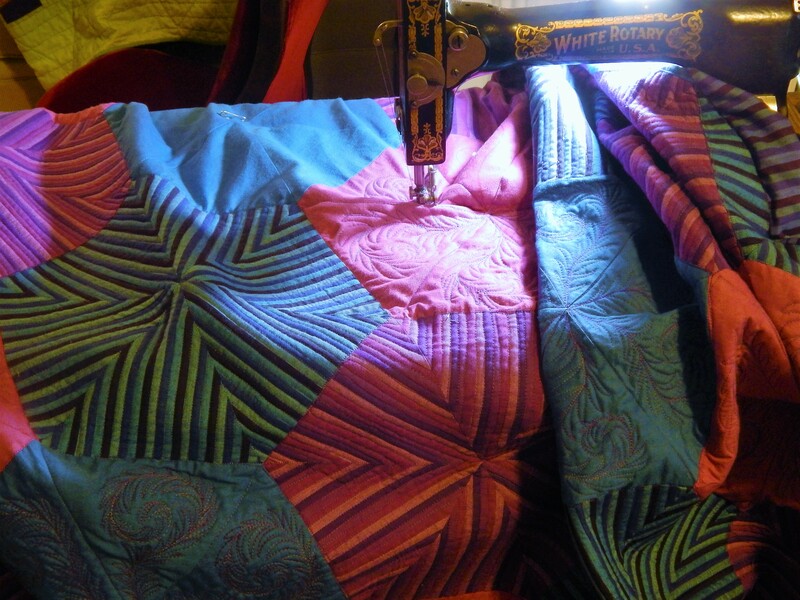 This quilt is really worth saving and I am sure that you will do it proud! Restoring that one’s going to be a real labour of love. How anyone could butcher such a pretty thing is beyond me, but you’ll give it a second lease of life, I know. I can’t imagine piecing all those little points. It is really an amazing quilt. I too enjoy looking through Julie Silber’s site at the quilts for sale. She always has such beautiful ones for sale. The Indian Summer blocks look like they were pieced fairly accurately from the photos, At least they should be an easier fix than your Lone Star one! 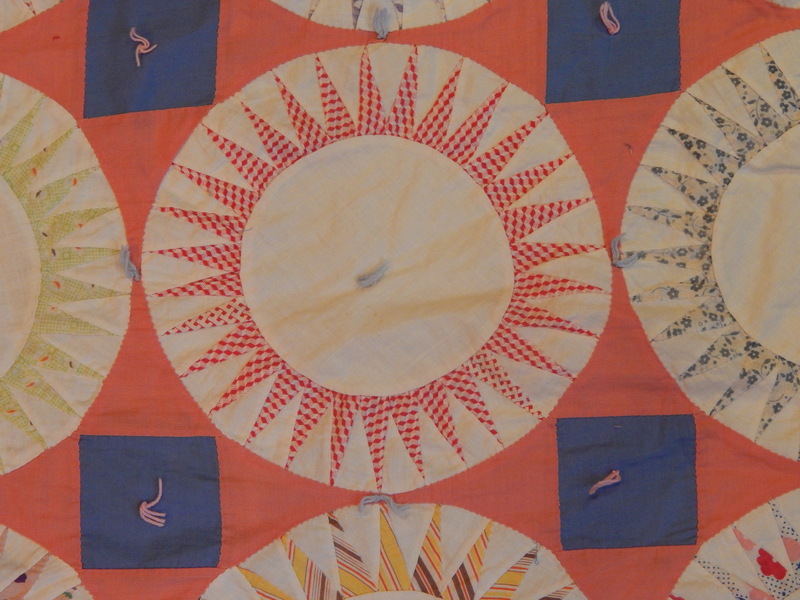 It’s wonderful if someone can save these old quilts and you’re the one to do it! 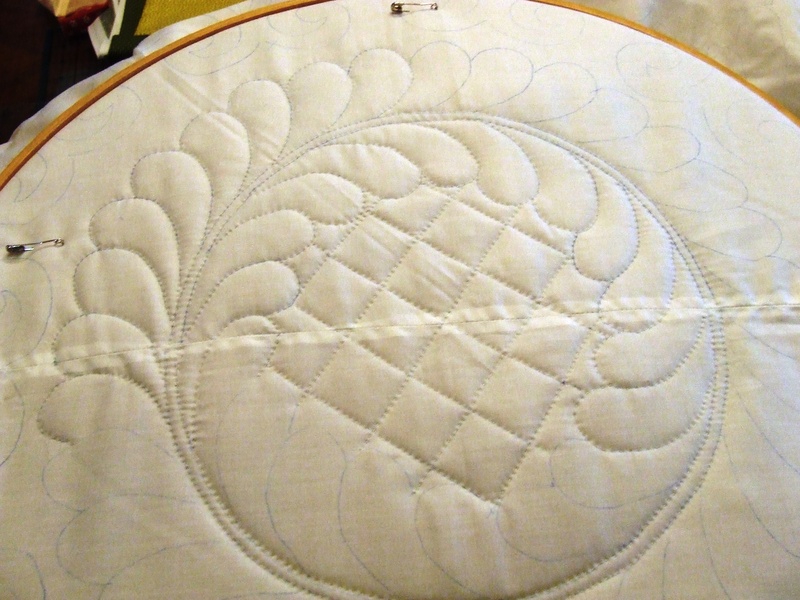 When you say you will have to replace some fabrics because of the seams wearing, would you applique a same size piece over the top of the worn one as I’ve had a conservator recommend to me (on my hand stitched quilt TOP), or would you completely replace it? My thought is to hand stitch another piece in and then carefully remove the frayed bits from the front without disturbing the original stitching threads which are anchored who knows where. All can say is WOW!